Jim Bourg-Pool/Getty ImagesSen. 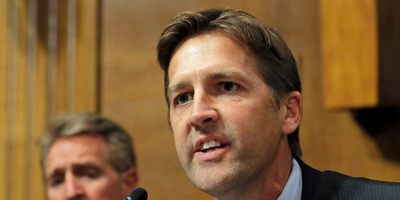 Ben Sasse of Nebraska. Republican Sen. Ben Sasse of Nebraska gave an impassioned speech Wednesday night on the Senate floor about sexual assault and the #MeToo movement. Sasse also dropped a bombshell about where he stood on Brett Kavanaugh’s nomination to the Supreme Court, saying he preferred a different candidate when Trump chose Kavanaugh. Then Sasse turned back to Trump. “We all know that the president cannot lead us through this time,” he said. Sasse also dropped a bombshell about where he stood on Brett Kavanaugh’s nomination to the Supreme Court, saying he had pushed for a different candidate before Trump chose Kavanaugh. And then Sasse turned back to Trump. “We all know that the president cannot lead us through this time,” he said. Kavanaugh, once seen as having a clear path to the nation’s high court, has become the subject of multiple sexual-misconduct allegations leveled against him by former high school and college classmates. The first of those accusations came from Christine Blasey Ford, a California university professor who accused Kavanaugh of sexually assaulting her while the two were high-school students in the 1980s. New questions about Kavanaugh’s drinking habits have emerged in recent days, with some former classmates coming forward to publicly cast doubt on his characterizations about his relationship with alcohol. The FBI recently opened a background investigation into Kavanaugh that is expected to wrap up soon. Kavanaugh has repeatedly denied any wrongdoing. Most Republican leaders, including Sen. Mitch McConnell, have accused Democrats of acting in bad faith to sink his nomination. McConnell on Wednesday night set up a key procedural vote on Kavanaugh’s confirmation to the Supreme Court. A final vote could happen as early as Saturday.